Part 4 of Hidden History, featuring Peter Ward, paleontologist at the University of Washington and author of A New History of Life: The Radical New Discoveries about the Origins and Evolution of Life on Earth, who suggests that volcanic activity was precipitating a mass extinction event long before an asteroid impact ended the Cretaceous period, and David Morrison, senior scientist at the NASA Ames Research Center, who maintains that other geological forces were likely insignificant compared to the asteroid impact. The evidence of the dinosaurs extinction is pretty compelling. Along comes an asteroid crashing into the Earth 65 million years ago. It leaves a layer about a finger thickness throughout the Earth and can be precisely timed. Dinosaur fossils too vanish after that precise moment. Sounds fairly convincing, but no. Along comes one Peter Ward, who thinks that this simplistic elegant theory (which has quite a bit of evidence supporting it) it too “easy, simple and elegant” for him. No, the trouble is you see, there in no carbon dioxide involved there. So kill off Tyrannosaurus Rex we need CO2 as well as the asteroid. So he discovers that the Deccan traps erupted 100,000 years before 65,000,000 years a difference of 1/8th of 1 percent. He has precisely timed it. But SO2 isnt the gas we should be bothered about – it was actually CO2 which caused the temperature to rise by 5 degrees. 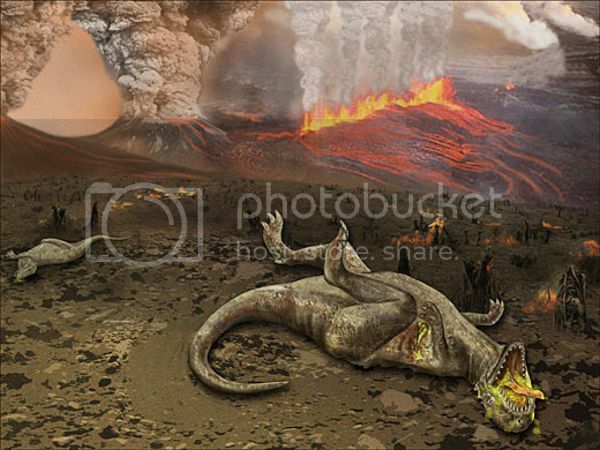 This caused the reptilian dinosaurs no end of grief and they started to die off with heat stroke by the time the asteroid struck, which was the straw that broke the dino’s back. This theory is far more enigmatic than the simplistic asteroid theory and hence far more compelling from a scientific point of view. I did read the Deccan traps were dated between 66 and 63 million years ago, but that was by geologists I guess who may not be so clued up.